All Star Flags has the official Coast Guard flag for sale here! This is a high-quality nylon USCG flag. Our Coast Guard flags are fully dyed for great outdoor performance. Four rows of stitching on the fly end make our Coast Guard Flags durable in all conditions. Coast Guard Flags are finished with a canvas header and two brass grommets. All our Coast Guard Flags are proudly made in the USA. The USCG flag has a white background with the Great Seal of the United States, and a banner that reads "United States Coast Guard", and above are the words "Semper Paratus"--Always Ready. The shield that adorns the eagle's breast on the USCG flag has a blue chief over vertical white and red stripes. It also incorporates the date, 1790, which is in fact the year that the predecessor of the Coast Guard, the Revenue Cutter Service, was founded. The Coast Guard was officially formed in 1915 when the Revenue Cutter Service merged with the US Life Saving Service. Like other service flags, in presentation form, the official Coast Guard Standard is finished with 2.5" bright gold fringe and is to be flown only with the National Colors, never alone, and with all Campaign Streamers attached. The Coast Guard is unique in that it has two officially recognized flags. The Coast Guard standard (the Coast Guard flag for sale here, described above and widely referred to as the Coast Guard flag) is flown on land. The Coast Guard Ensign flies on USCG cutters (vessels). The Ensign features 16 vertical stripes, alternating red and white. The canton is white with a dark blue US Coat of Arms. On the fly is the Coast Guard Badge. The US Coast Guard is a unique branch of the Armed Services in that it is the only branch that has general law enforcement authority. The Coast Guard Ensign is one such outward symbol that is recognized around the world of this authority and it is displayed on all USCG cutters along with the National Ensign while on patrol. All Star Flags has the official Coast Guard flag for sale here! 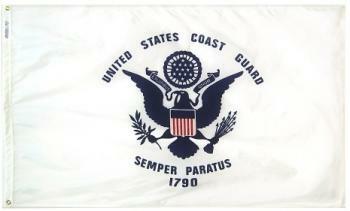 Coast Guard Garden Flag - Nylon - 12x18"